Shown only as a yearling Silver Legend had an unprecedented career with 7 consecutive color championships (no reserves!) As impressive as that is, his cria have outdone him. 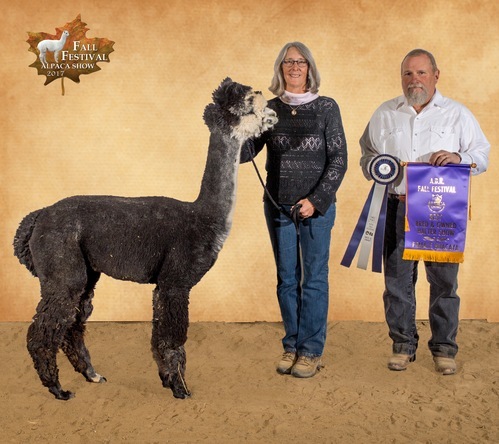 As of 2011 19 Silver Legend cria have been shown, producing 90 blue ribbons and 49 champion banners. 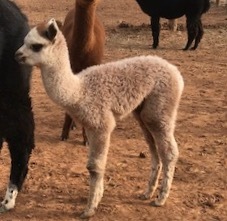 Silvi's cria are 75% gray bred to fawn, black, maroon, and gray dams. His cria are uniformly fine, ranging from 16.5 to 20.4 AFD. Silver Legend's breeding book is now closed. 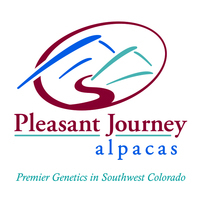 Evan as she has aged, A Paca Fun's Mystique has remained a cornerstone of our breeding program and we are retaining 4 of her daughters. Mystique is a blue ribbon and banner winner herself, but in addition to this she has produced 2 generations of blue ribbon winners. Mystique is a full pattern tuxedo silver gray, out of tuxedo silver gray and black parents. 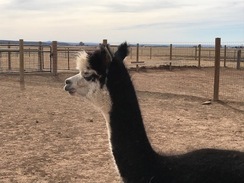 All of her cria have been color, and bred to black or tuxedo gray she has always produced black or tuxedo silver gray. 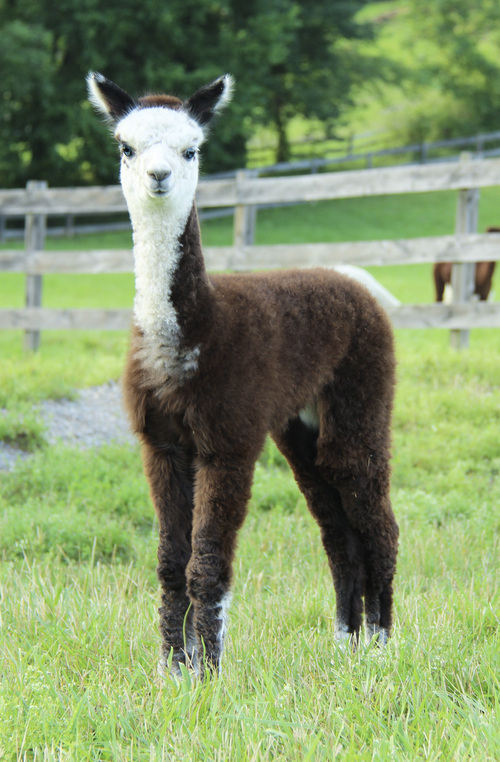 She is currently bred to Aussie 38 Special for a fall 2014 cria! It is not everyday that an opportunity comes knocking on your door! We have learned that when it does, open the darn door! We opened the door for the gorgeous classic dark silver grey female. Her sire is the incredible Silver Legend of KPR from A Paca Fun Farm. After being introduced to Silver Legend in 2013 and seeing how he stamps his offspring with stature and fleece we had to add this young female to our herd. 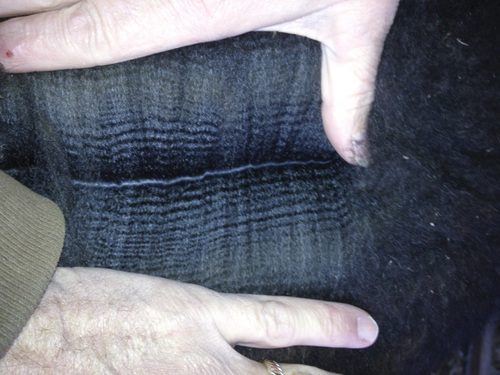 Take a look at this girl and the fleece that she is carrying! Awesome! Crimpy, bright and shiny! We met Trifecta for the first time at the 2014 AOA Nationals. This is how much we believe in this line and in Neil, Jo and Bari Padgett. We bought her sight unseen. 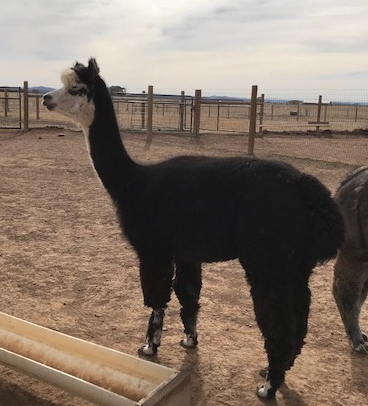 Yes, we must admit that a huge part of the draw for purchasing this girl and adding her to our herd is the fact that she is bred and confirmed pregnant for a May 2015 offspring with A Paca Fun's Super Sonic! . What a pairing this will be!! Cannot wait for 2016! Tessa birthed a lovely Classic Dark Silver Grey female on 5/9/2016 sired by A Paca Fun's SuperSonic! This daughter, named PJA Sonic's Sweet Reflection, has gone on to be a winner in the show ring! Most recently taking 1st place bred & owned at ABR FallFest 2017 and then the BEST BRED & OWNED female! 10/23/2018 - Tessa birthed a very handsome classic light/medium grey boy sired by Annual's Chrome Finish! Another textbook birth by this GREAT dam! Tessa is being offered with her son, PJA Chrome Smoke on the Water. He is a spitting image of sire, Annual's Chrome Finish. Tessa is currently open so you can choose your breeding!! We have great options!! Tessa is an absolutely incredible dam. She is one of those one in a million girls that will allow more than one cria under her at a time. Very caring for her own babies!